The Matthew Fontaine Maury Fellowship Award is made possible by an endowment that was created in 1988 by Retired U.S. Navy Captain J. Maury Werth to honor his great-grandfather Matthew Fontaine Maury, a son of Virginia often referred to as the “Father of Oceanography” and the “Pathfinder of the Seas.” Captain Werth and other family members have contributed to the endowment over the years. Sadly we lost this great friend of VIMS earlier this year. His son James Werth and other family members are here with us today to honor Captain Werth’s contributions. The Maury Award recognizes interdisciplinary achievements in marine and environmental scholarship, research, and/or policy/management efforts, and outstanding publications, thesis, or dissertation work. This year’s winner is Heidi Giesz. Heidi Geisz is a deserving recipient of the Matthew Fontaine Maury Student Fellowship Award. She is an outstanding and well-rounded graduate student as evidenced by her numerous accomplishments. 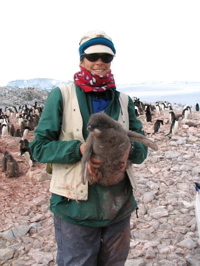 In 2004, Heidi was awarded an Environmental Protection Agency STAR fellowship for her thesis research on persistent organic pollutants in Antarctic seabirds. In 2008, she published her first research paper from her dissertation entitled “Melting Glaciers: A Probable Source of DDT to the Antarctic Marine Ecosystem”, which was featured on the cover of Environmental Science and Technology. Heidi’s research also includes using stable isotopes to understand the sources of contaminants in migratory seabirds that breed in Antarctica, and she is further using her research findings to better understand the ecology of Antarctic seabirds. In addition to her strong interdisciplinary research, Heidi is an outstanding student-citizen. She has served as president of the VIMS graduate student association and as a lunch-buddy to a local Gloucester elementary student. She has also talked about her Antarctic research to several community groups, donned a penguin suit to lead the VIMS Marine Science day parade, and represented VIMS as a President’s Aide at The College of William and Mary. Heidi’s research work truly exemplifies “interdisciplinary research and achievements” integrating the areas of marine biology, environmental chemistry, and ecology with a geographic focus on Antarctica and the impact of climate change in that region. Because of the quality and breadth of her research and her natural leadership abilities, Heidi is truly deserving of the Maury Award.